If you were kicking yourself for missing this event last year…the wait is over. Cyber Monday 2016 was such an unqualified success we decided to rinse and repeat! 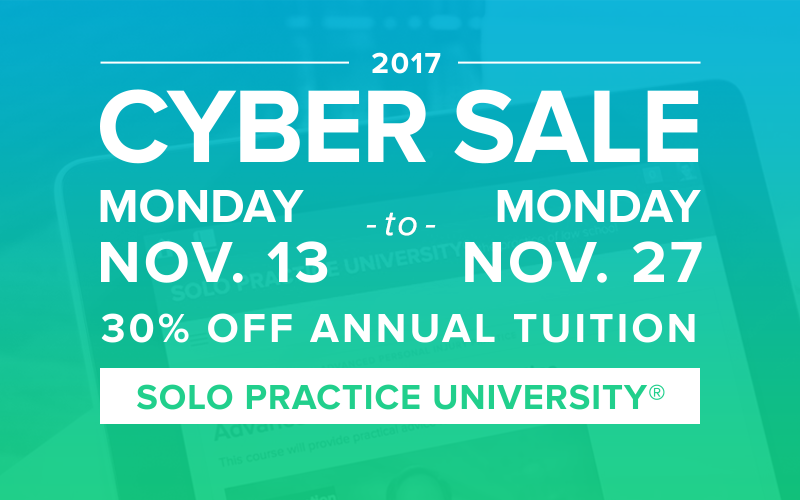 For 14 days, Monday, November 13th through Cyber Monday, November 27th, when you enroll as an ANNUAL student at Solo Practice University® you will receive 30% off your first year’s tuition…and every year thereafter when it automatically renews. There is no coupon code needed. Just enroll by 9 pm PST – Monday, November 27, 2017 – and your tuition will be just $557! Crazy, right? That’s 12 months of unparalleled professional education including all our new courses, professional networking, free unlimited online CLE for one year, and a complimentary one half hour law practice management consultation with one of our three world-class LPM Consultants…all for less than $47 per month! If your CLE is due by December 31, 2017, what are you waiting for? With our strategic CLE partner, the National Association of CLE, you’ll be able to get 2017 and 2018 CLEs done. That’s two years worth of online CLEs for free! This offer is too good to miss if you are serious about creating and building your own solo/small firm practice. But hurry! This offer definitely ends 9 pm PST, Monday, November 27, 2017. If you missed out last year and have been kicking yourself for 12 months, now’s your chance. We can’t wait to ‘meet’ you on ‘the inside’. P.S. This offer is available only to new annual students, former students, or to existing SPU students currently enrolled at the monthly or semi-annual level who wish to upgrade to annual. If you have any questions, please get in touch. P.P.S. Please share this incredible offer with your colleagues and law students. They’ll deliver pizza to your door and send you flowers! This entry was posted in Announcements, News and tagged CyberMonday 2017. Bookmark the permalink.